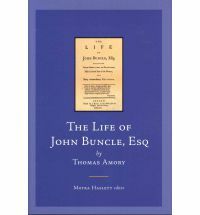 The Life of John Buncle, Esq, by Thomas Amory, and edited here by Moyra Haslett, is to the modern reader a remarkable book. Although not as famous as Irish eighteenth-century novels such as Jonathan Swift’s Gulliver’s Travels and Laurence Sterne’s The Life and Opinions of Tristram Shandy, it is nonetheless a brilliantly eclectic offering of Enlightenment possibility, and, in its eccentricity, an exemplary piece of eighteenth-century fiction. Before Ezra Pound tricked the world into believing that it was twentieth-century modernism that was “making it new”, there were novelists such as Amory, whose range of styles, experimentalism and literary reference – to the point of whole-scale plagiarism – points to the great formless democracy that is the early novel. This new book covers a period that is particularly fascinating, albeit somewhat confusing, for photographic historians. The Irish revolutionary period offers a rich photographic archive. Portraits range from official mugshots held in government archives to family portraits commissioned from commercial photographic studios. Snapshots taken by onlookers and documentary images captured by press photographers offer powerful depictions of armed combat and its aftermath. All of these could be and were manipulated and circulated for the purpose of propaganda or indeed suppressed or hidden by the various sides. The chaos which prevailed at certain times during the period scattered photographs far and wide and has left a bewildering array of personal and private collections which both excite and perplex the researcher and historian of the period. The matter of provenance can be challenging for such a disparate group of photographs. Prints can be held simultaneously by multiple institutions and individuals. Generally speaking, the holder of the negative, if it exists, takes primacy over the print owner although many have been lost over the years. The further you move away from the original source negative the poorer the image quality becomes, so that second, third and even later generation prints can lose definition and clarity. For these reasons, when conducting photographic research, I tend to use photographs where the negatives or original prints are held by public institutions. The assignation of a verifiable number to each image and clear provenance and copyright for the collection make them more accessible and usable than those held by private companies and individuals. This title from the Early Irish Fiction series presents us with a selection of children’s stories published between 1765 and 1808. With an excellent introduction by editor Anne Markey, the book includes three tales: John Carey’s Learning Better than House and Land; Lady Mount Cashell’s Stories of Old Daniel; or, Tales of Wonder and Delight and various versions of Henry Brooke’s fable of the three little fishes from The Fool of Quality; or, The History of Henry, Earl of Moreland. 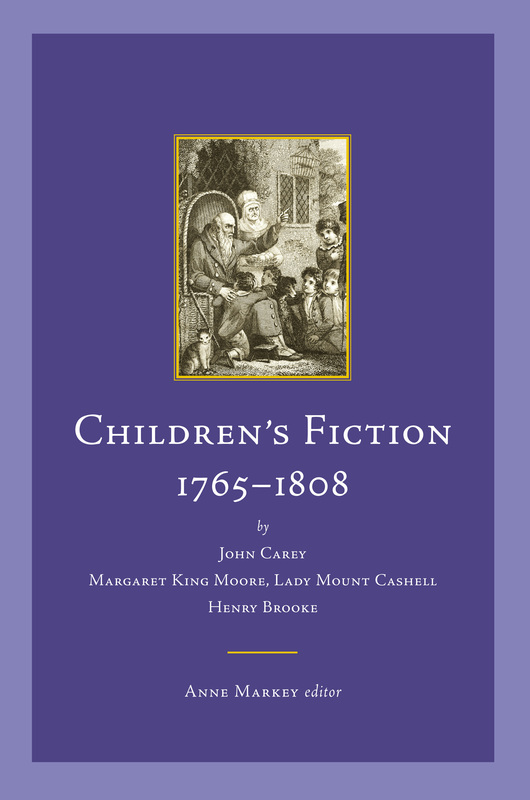 This is an extremely timely and important publication as it makes a valuable contribution to studies in Irish children’s literature and, in turn, to studies in eighteenth century Irish literature more generally. 2011 is the centenary year of Brian O’Nolan’s birth. Better known as Flann O’Brien, his work represents the last great rebellion of Irish modernism before the naturalist mysticism of Patrick Kavanagh, John McGahern and Seamus Heaney suppressed the comic element in Irish writing. Along with The Third Policeman (1967), At Swim-Two-Birds (1939) is the last outpost on the border between the radical ambition of the Irish modernism, and the introverted helplessness of much of post-war Irish literature. 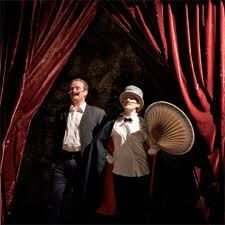 After reading O’Brien’s At Swim-Two-Birds, James Joyce famously said, ‘that’s a real writer, with the true comic spirit’. In 1829 a new settlement was devised by the British in Western Australia. Under the governorship of Captain James Stirling, the Swan River Colony was established as a ‘free’ colony – unlike the penal settlements of New South Wales, Norfolk Island, and Port Arthur. Two main sites of settlement developed within the colony: the state’s capital Perth and the port city of Fremantle. Due to adverse climatic conditions and inhospitable lands the population of the area remained low. In order to rectify this and to assist with the development of the region a petition was sent to the British Government requesting that convicts be sent in order to provide much needed cheap labour. The first ship carrying convicts arrived at Fremantle on 1 June 1850. Over an eighteen year period over 9,700 convicts were transported to Western Australia. The last ship – the Hougoumont – arrived 9 January 1868 carrying 280 convicts. 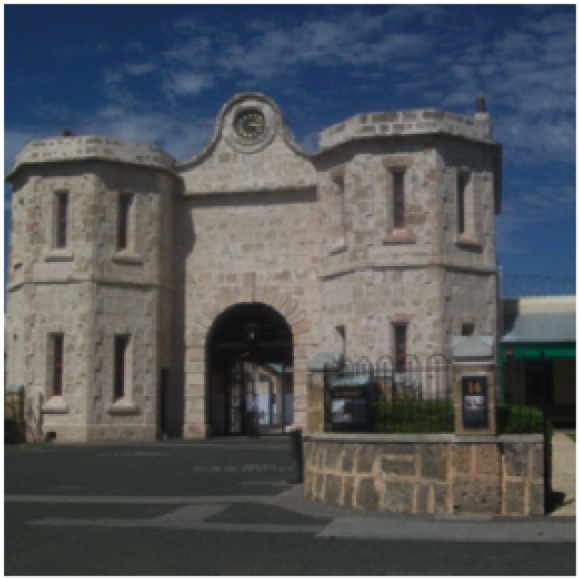 In 1991 after 136 years of incarceration and punishment Fremantle Prison was officially closed. A year later the prison began its development as one of the State’s major historic heritage sites. In July 2010 Australian Convict Sites were included in a list of seven cultural sites newly inscribed on the World Heritage List. Searching for a Christmas gift for someone with an interest in Irish women’s history or the republican movement? 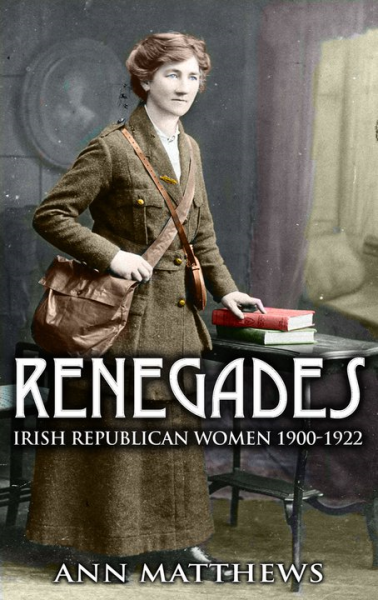 Look no further than Ann Matthews’ Renegades: Irish Republican Women, 1900-1922 (Cork: Mercier Press, 2010). Priced at €19.99, this highly readable paperback would make a great stocking stuffer. 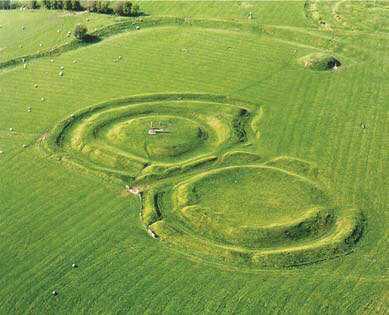 A tapestry of green and brown fields guarded by haw-laden hedgerows unfolds on all sides. The summit of Tara, reached via a muddy path through squelching wet grass, rewards with views of twelve of Ireland’s counties. Under the mud, further treasures abound. However, without interpretation, it can be difficult to appreciate the significance and richness attached to Tara’s series of grassy ditches, mounds and dips. In Murder at Shandy Hall Michael Sheridan (journalist and author of Death in December and Frozen Blood: Serial Killers in Ireland) pieces together a murder which took place in 1887 of a wife, Mary Laura Cross, and the subsequent trial of her arsenic poisoner husband Dr Philip Cross. The nineteenth century was a golden time for poisoners. Arsenic, which has no smell or taste is incredibly difficult to detect in food and drink, was the poison of choice. 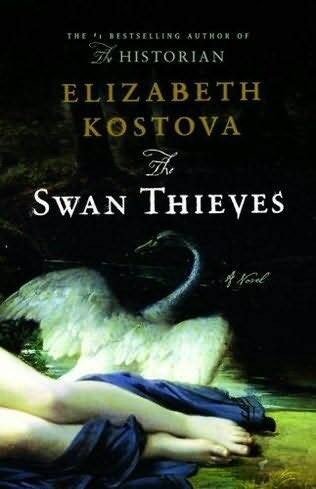 I am a big fan of Kate Summerscale’s historic crime investigation The Suspicions of Mr Whicher so I jumped at the chance to review this and learn a bit more about Irish criminal cases in the nineteenth century. 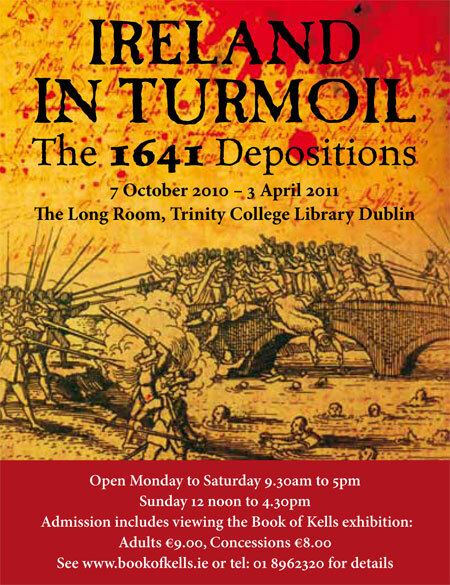 On Saturday I was lucky enough to be escorted around the new exhibition at the Trinity Long Room: Ireland in Turmoil: The 1641 Depositions by the co-curator of the exhibition Eamon Darcy. The digitization of the depositions is Ireland’s largest digital humanities project to date. If you are not familiar with the 1641 depositions, they are over 3,000 testimonies which were taken by a team of government officials in the aftermath of one of the most violent events, the 1641 rebellion. There is a very nice explanation of the significance of these depositions, as well as the scope of the project from the RTE 6 O’clock news that you can watch from Youtube here.